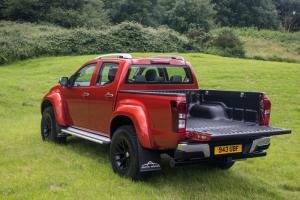 It seems you’re no-one these days if you don’t make a pick-up. Some of us actually want our ‘utes to work for a living. Thankfully, in the face of all this gentrification, one company decided to take a different road. 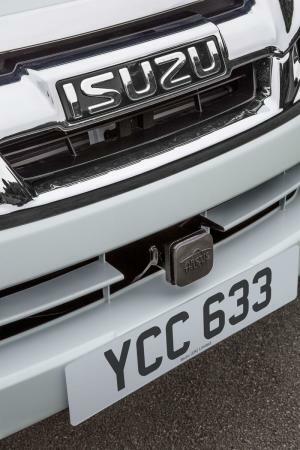 Isuzu, perhaps to crown their 100th anniversary celebrations, packed their already capable D-Max off to Iceland to be fiddled with by Arctic Trucks, the company that’s been re-engineering 4x4s for life in the frozen wastelands for the best part of 25 years. 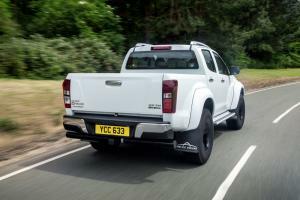 The result is the D-Max Arctic Trucks AT35. 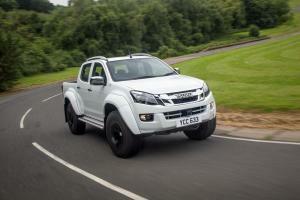 And it’s the most extreme pick-up on the market today. 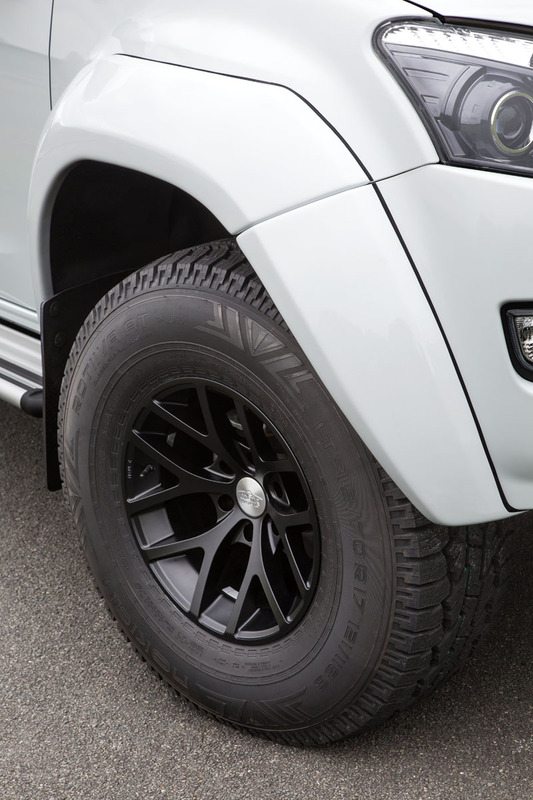 The name is derived from the most obvious modification they made – the fitment of 35-inch tyres, Nokian Rotiiva 315/70 R17 All Terrains on new 17×10-inch wheels with a 25mm offset – and to accommodate them they fitted a chunky set of fender flares. Preserving some semblance of steering lock necessitated the trimming of some of the iron mongery inside the wheel wells, although this has all been carefully done – for instance, there’s a new chassis end plate rearward of the front wheels, and other than the fact it bears a rather neat laser-cut Arctic Trucks logo, it’s indistinguishable from the factory stuff. To stop those 35s collecting the bodywork during compression, the D-Max has been given a 30mm body lift and a 20mm suspension lift, complete with Fox Performance dampers. Ground clearance increases to 318mm at the rear axle, while the approach angle increases by 6 degrees to 36, and the departure by 5 to 28. The ramp-over angle, meanwhile, jumps from 22 to 32 degrees, and the wider footprint means the AT35 easily maintains a 49 degree side slope ability – well beyond the sphincter factor, I can assure you. 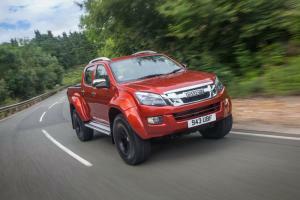 Despite these changes, the D-Max retains its useful one-tonne payload and 3.5-tonne tow rating. And, as a commercial vehicle, the receiver hitches fitted by Arctic Trucks can legally be used for towing as well as recovery. 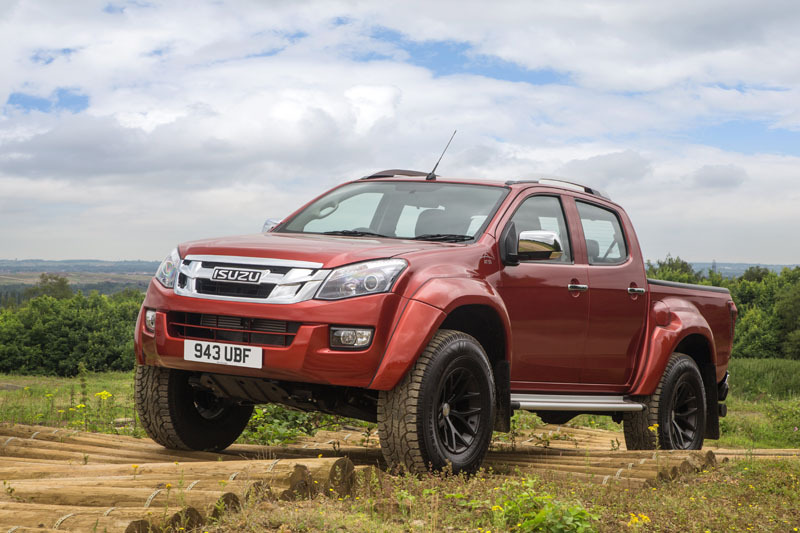 Also retained is the familiar 2.5-litre twin-turbo diesel engine with its 163PS and 400Nm of torque, along with Isuzu’s part-time four-wheel-drive system with its low range mode and 60mph shift-on-the-fly capability. 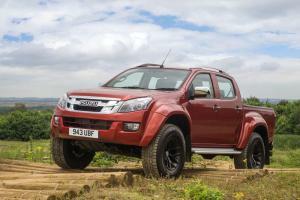 There’s also the choice of either six-speed manual or five-speed automatic transmission. 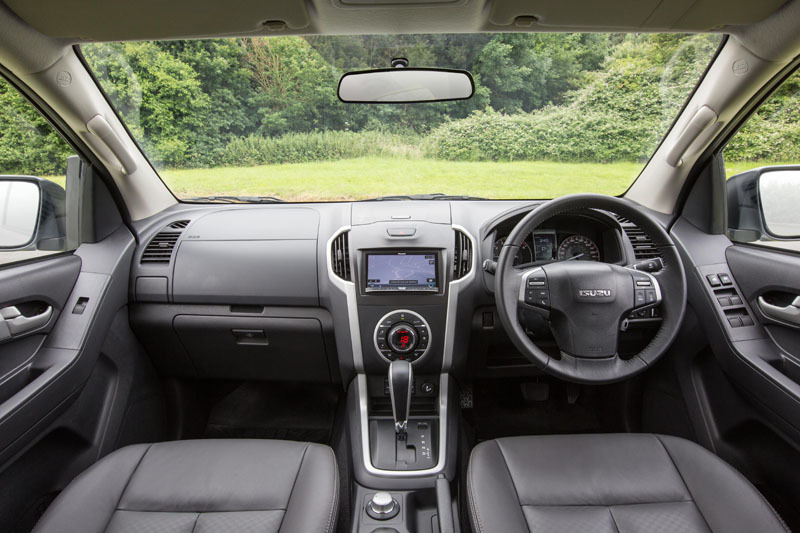 The interior is D-Max business as usual, although double cab models get heated leather seats and climate control as standard, plus the option of a Pioneer media and navigation system with reversing camera, which we’d recommend as it’s easy to lose an entire car from your rear view thanks to the extra height. Things get different, however, as soon as you try to climb board. Because unless you’re about 10 feet tall, you’ll need to make use of the extended side steps just to get in. Out on the road, other traffic quickly learns not to pull out in front of you, and the sheer frontal aspect of it leaves oncoming drivers visibly open-mouthed as you barrel down the road towards them. Of course, it does need some adjustment to drive responsibly – a quick glance in the mirrors reveals a view filled by the rear flares, and squeezing through gaps in traffic requires a bit of mental recalibration to avoid relieving other road users of their door mirrors. Given its size, it’s still remarkably docile on the tarmac. The Fox dampers make a good fist of keeping body movements in check, although there is a fair degree of longitudinal pitching over larger bumps. Some of that stems from the suspension modification’s use of a lift block on the rear leaf springs and a spacer for the front coils – swapping in a slightly longer set of parabolic leaf springs and extended coils would have achieved a greater degree of control while also improving axle articulation. 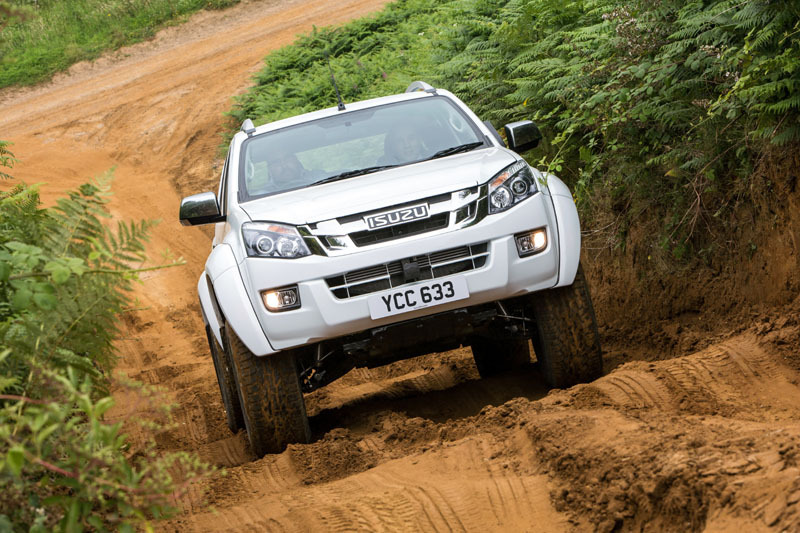 Despite the larger tyres, Isuzu opted to leave the standard axle ratios in place, and this does rob the AT35 of some of its performance. 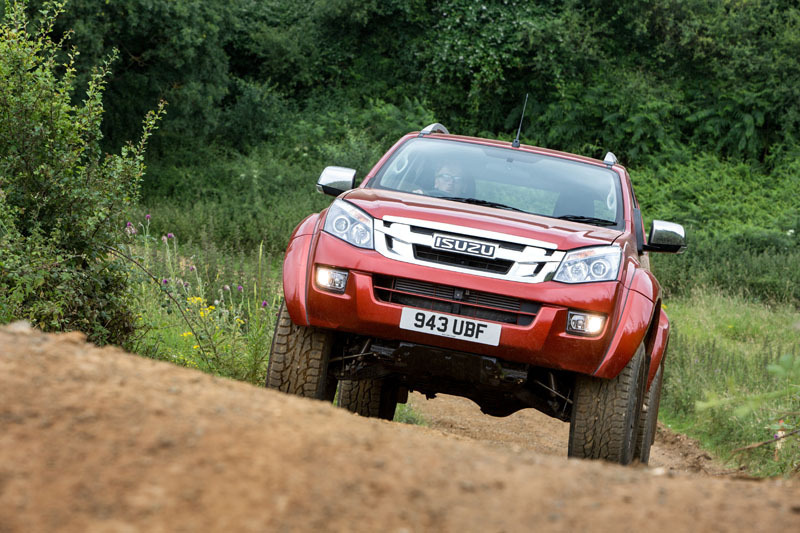 Although the D-Max could never be described as ‘sprightly’ even in standard form, the 2.5-litre twin-turbo always felt satisfyingly strong and untroubled by hills or headwinds. In the AT35, it now has to work harder to pick up and maintain speed, and automatic models constantly kickdown to try to overcome the impact of the larger rubber. 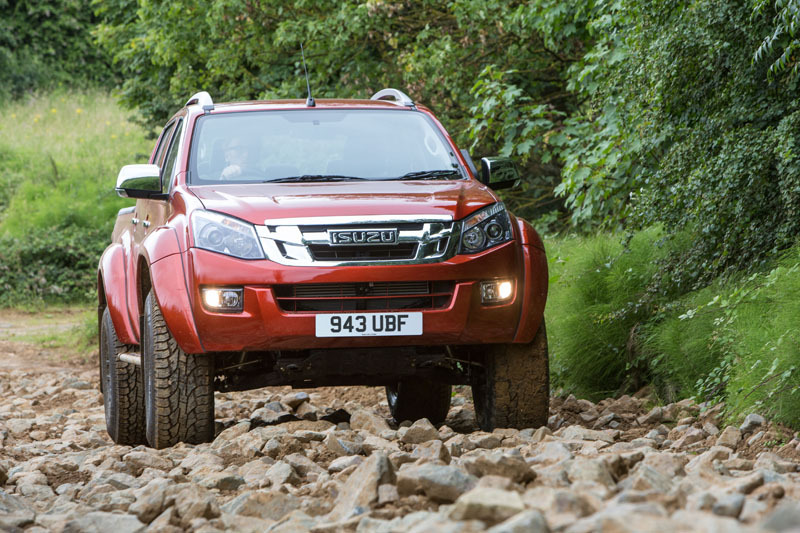 It also has an effect on engine braking during off-road descents, although thanks to the six-speed manual’s usefully low first gear, this isn’t as much of a problem as it could have been. 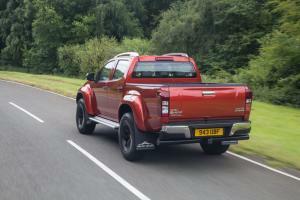 It’s a shame, too, that the AT35 inherits what continues to be a curious omission from the rest of the D-Max range: there’s no rear diff lock. 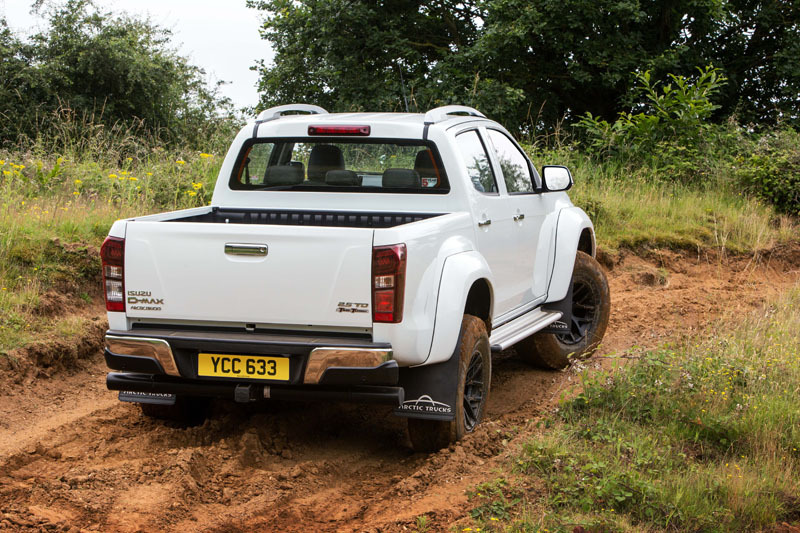 Standard on the Toyota Hilux and an inexpensive option on the Ford Ranger, a vehicle with these off-road credentials really needs a locker of some kind in the rear axle. 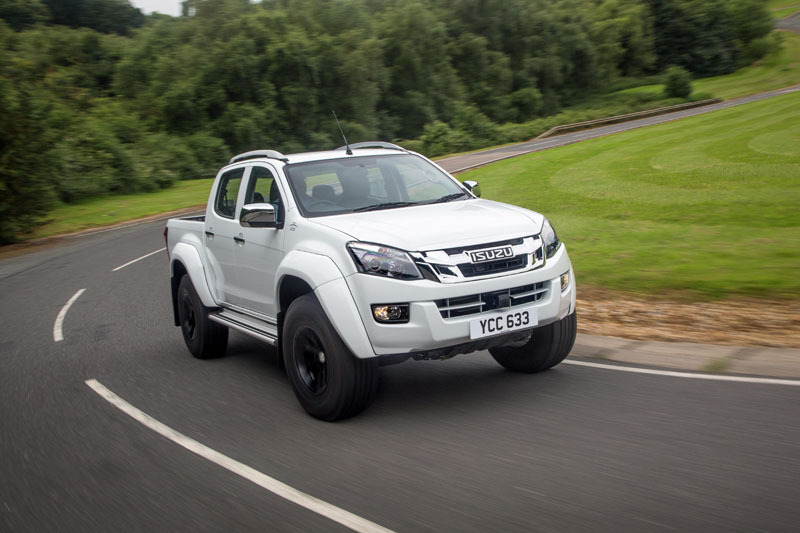 That said, its Arctic origins are less about rock-crawling and more to do with distributing weight over the greatest possible contact patch, and at that the AT35 excels. Here in Blighty, conditions tend to be somewhat muddier, and although a more aggressive tread pattern might help in the search for traction in some conditions, that would come with a trade-off all of its own. As it is, on our woodland course the Isuzu was untroubled by everything we threw at it. But could you use it every day? Well, I know I certainly could. Because driving this thing around is an exercise in sheer awesomeness. Just don’t expect it to fit in a standard parking space, though. 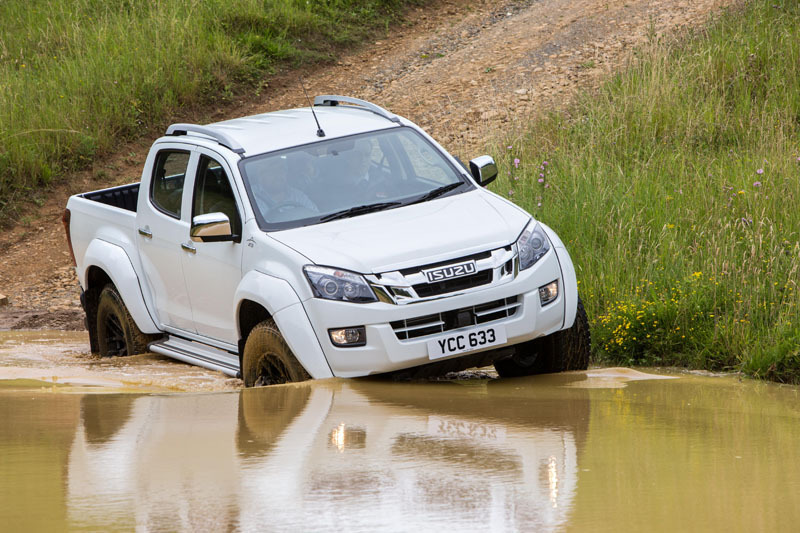 The Rotiiva tyres are remarkably quiet on the road, a benefit of their less aggressive tread blocks, although it doesn’t take much effort to break traction in the wet. Having the aerodynamics of an iceberg makes for poor fuel economy at motorway speeds, but after a week with the automatic version, we notched up a respectable average of just over 28 mpg. 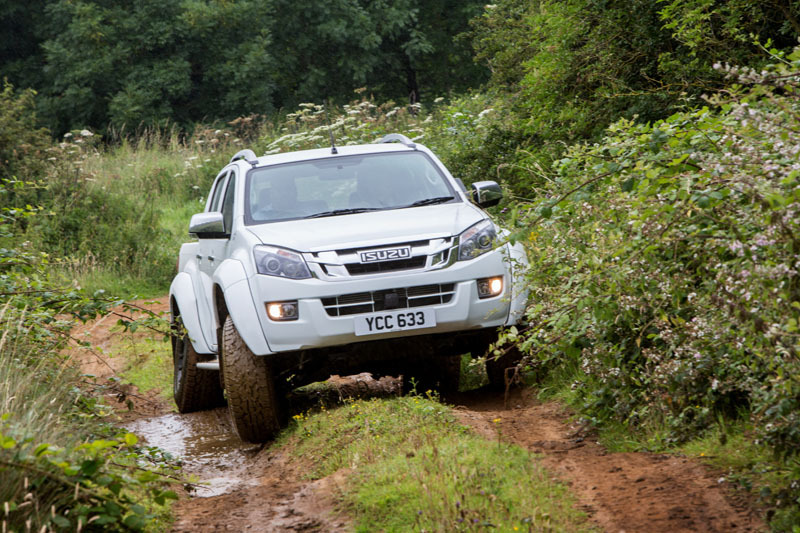 Great as all of that sounds, there are three reasons why the D-Max AT35 makes more sense than you might realise, and why Isuzu should be congratulated for having the balls to offer it. 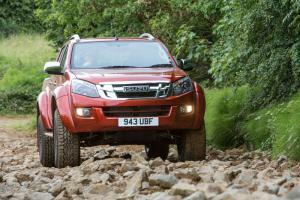 Firstly, all of this is covered by Isuzu’s five-year 125,000-mile warranty. Secondly, as a fully type-approved vehicle, Arctic Truck’s modifications are included in the AT35’s standard specification. 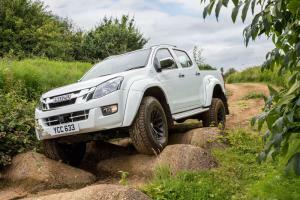 That means if you’re in the market for a 4×4 with 35-inch tyres, the Isuzu is the only way to achieve that without wrestling with insurance companies over non-standard parts. And lastly, there’s the price. 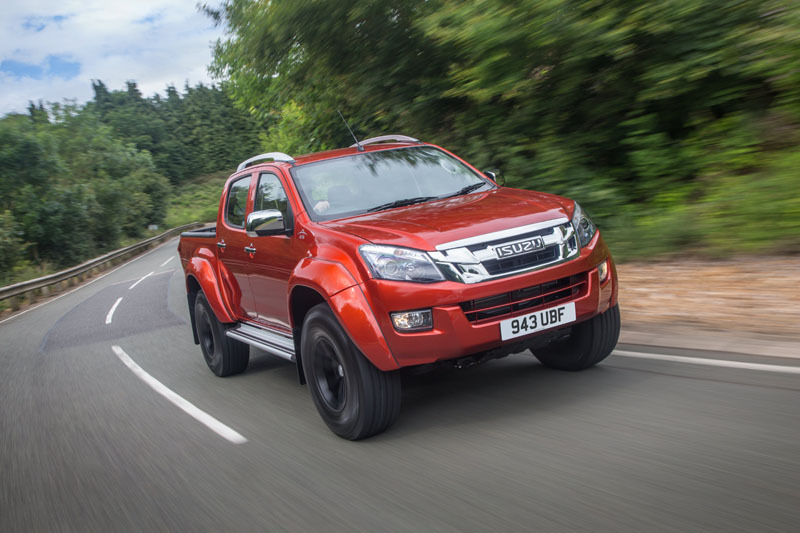 An extended-cab AT35 can be yours for £30,999 CVOTR, with the double-cab starting at £33,499. 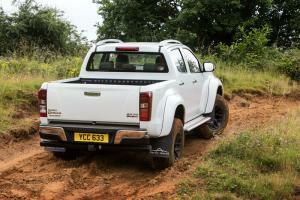 While forty grand after VAT may sound a lot for a pick-up, you can easily spend more on a less-capable Amarok. Previously, if you wanted your own monster truck you had little choice but to buy a standard one and ship it to Iceland for the full Arctic treatment. That, I can tell you, is eye-wateringly expensive. But with the AT35, you need only stroll into your local Isuzu dealer and drive home in one. 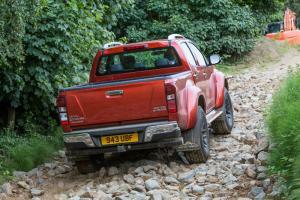 Safe in the knowledge that even if home is half way up a glacier, the D-Max will still get you there. Axle ratios should have been swapped – auto box constantly downshifts to compensate for larger tyres. A 4.26:1 ratio or similar would have retained stock performance levels.